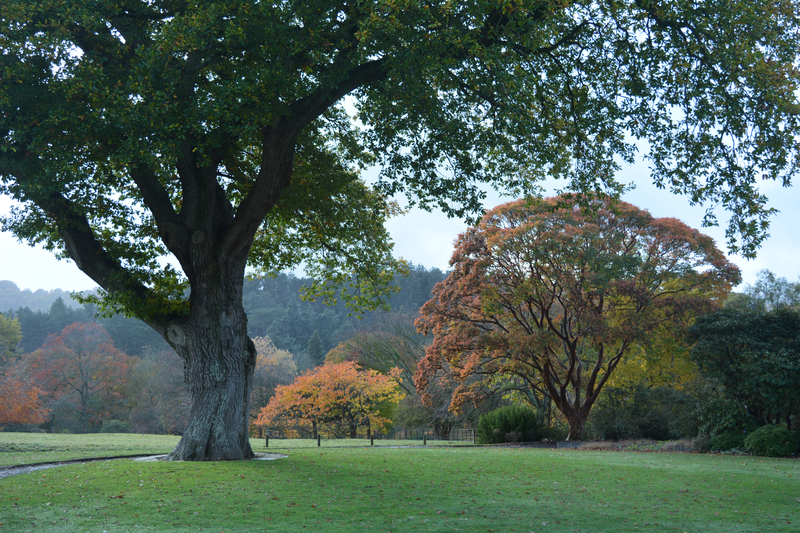 Bodnant Garden – an autumnal walk around a great garden. 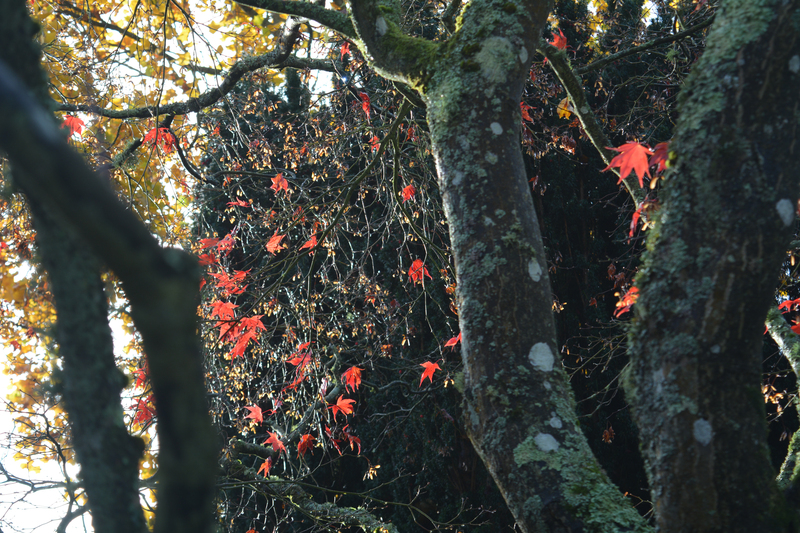 In the first post about our day visit to the Bodnant Gardens not far inland from the coast of North Wales we looked at the special magical nature of the low November sunlight. But there was a lot more for us to enjoy as we explored in a different direction than we usually take as autumn repair work on the grass paths and lawns prevented us following where our footsteps normally tread. This of course paved the way for new discoveries and fresh views. The plant that we got really excited about was this beautiful deciduous Euonymus dripping with a full crop of berries which in turn were dripping with fine droplets of rain. 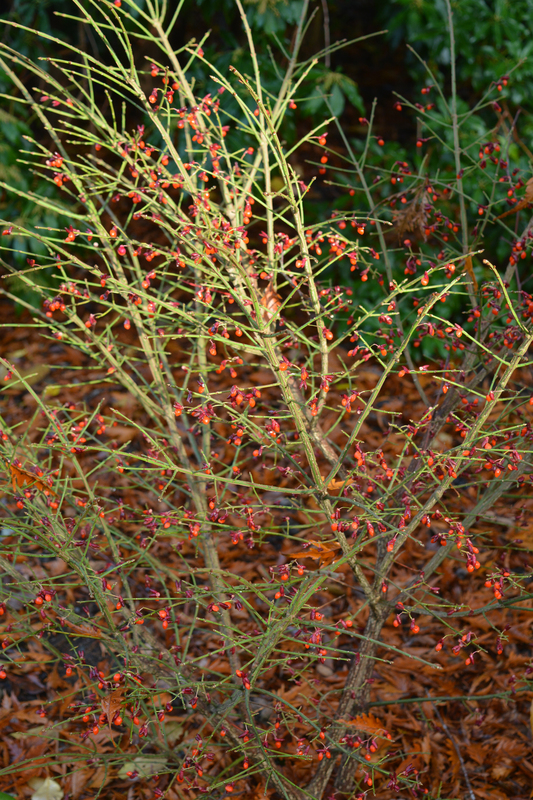 Euonymus alata “Compactus” bravely combines the darkest possible ruby red almost purple fruits from which burst bright tangerine orange seeds and it looked wonderful. 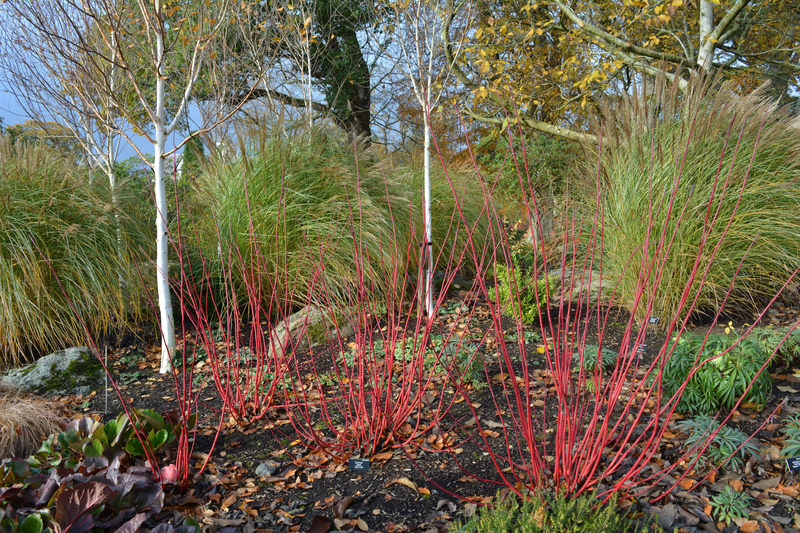 The younger berrying branches sported bright green coats in strong contrast to the older wood, coloured brown and strongly winged with corky ridges giving the whole bush an extravagant look. 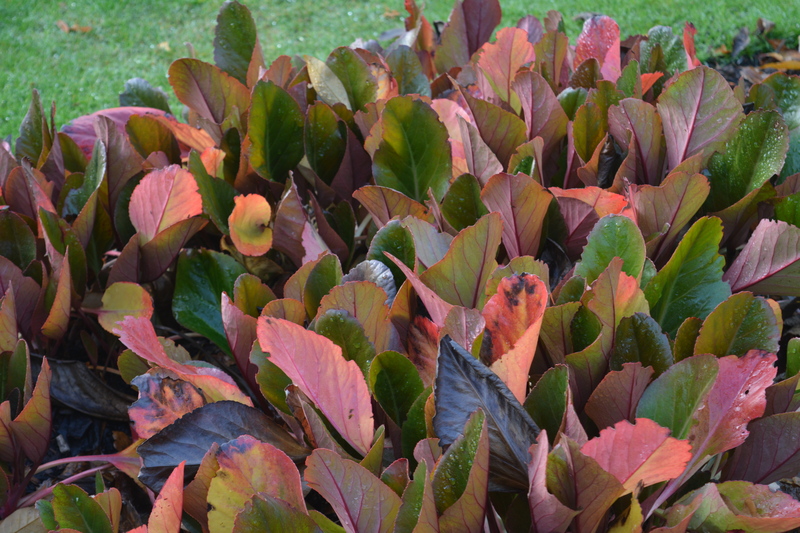 It also boasts fiery red foliage in the autumn and strangely its weakest point are the flowers which are small and a rather insignificant green in colour. 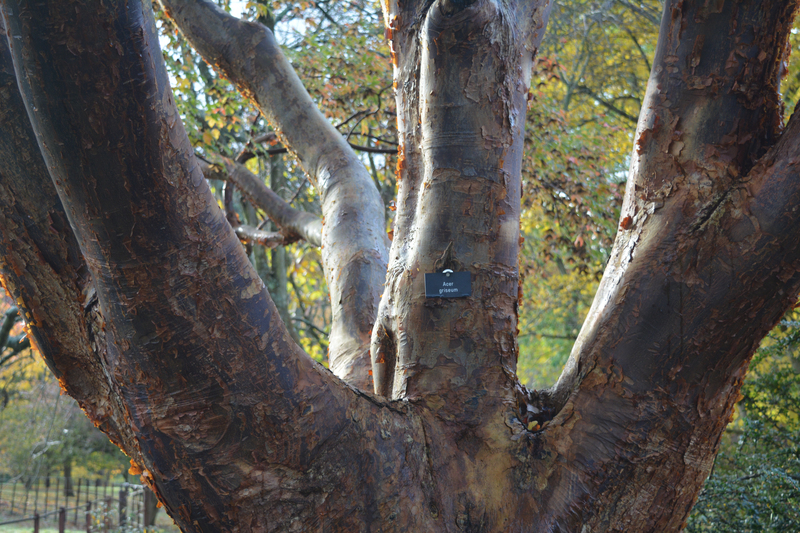 This exciting shrub had a lot of competition where catching the eyes of the visitors was concerned. 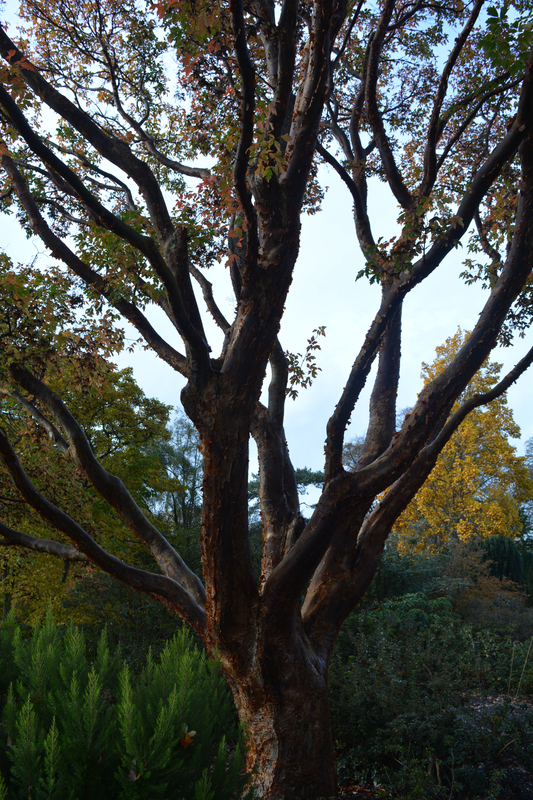 We love making new discoveries and on this visit to Bodnant we came across some fruit on a shrub which we could not remember having ever seen before and had no idea what it could be, with its tiny acorn-like fruits in two shades of orange. 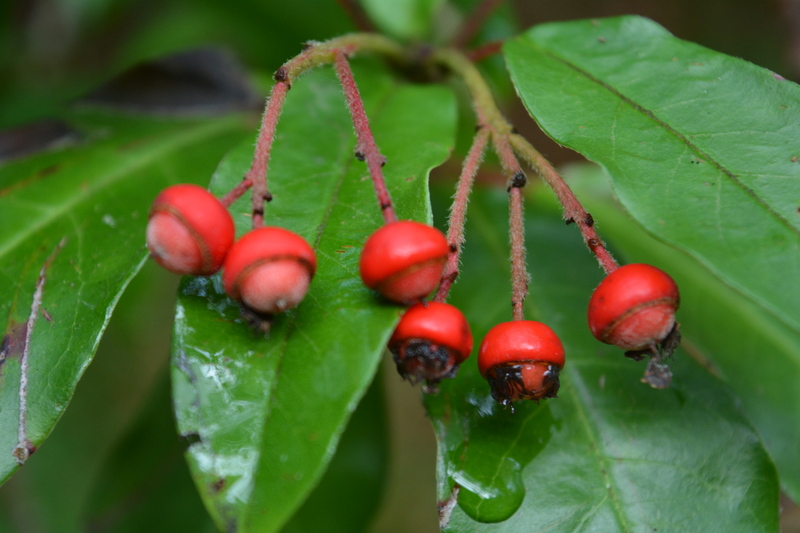 It looked if it would appear a rather dull evergreen shrub for most of the year but it must have flowers at some time which I would guess would be white. Back to our explorations! So, moving away from the Winter Garden, Jude and I followed gravel tracks which crunched beneath our feet, the sounds of which softened only where we had carpets of fallen leaves to paddle through. We moved into more open areas where we could appreciate views of large specimen trees in the distance as well as beautifully textured and coloured perennials right under our noses. 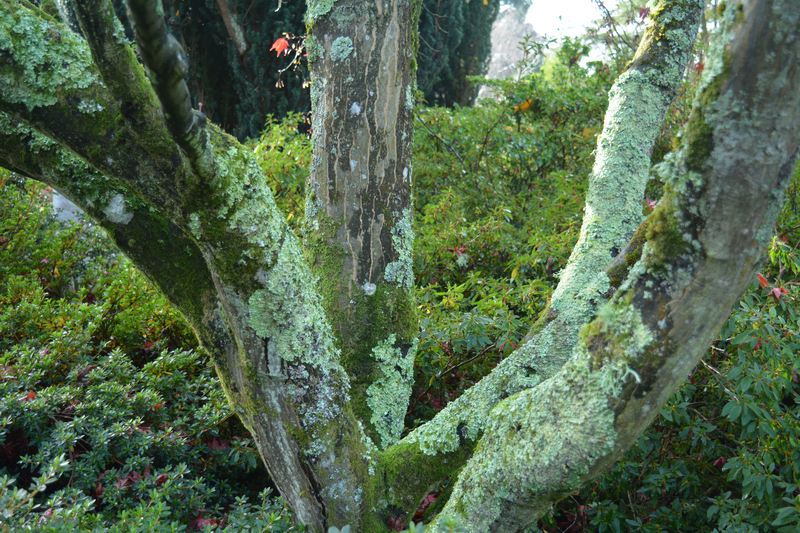 Trees in November show off their strong networks of boughs, and judicious pruning of the lower leaves by skilled garden staff add extra power. It wasn’t all foliage and tree trunk texture though, there were still late flowering perennials shining through contrasting strongly with the colours of autumn. This entry was posted in colours, garden design, garden photography, gardening, gardens, gardens open to the public, half-hardy perennials, hardy perennials, National Trust, ornamental trees and shrubs, The National Trust, trees, Wales and tagged Bodnant, Bodnant Garden, gardens of the National Trust, gardens of Wales, Natiional Trust Gardens, North Wales, The National Trust, Wales. Bookmark the permalink. 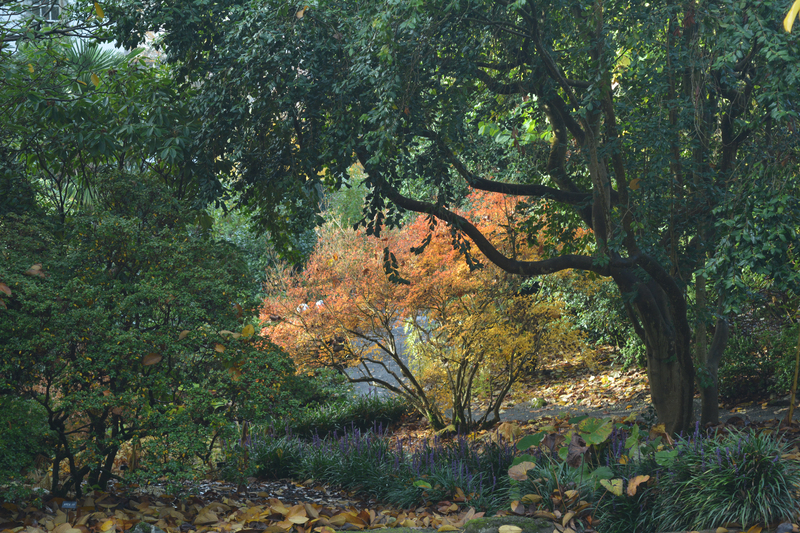 1 Response to Bodnant Garden – an autumnal walk around a great garden.